Thanks, I caught the 64 bit version of the tremor in the discord and it worked fine, even with bugs I'm going to use it with the other mods. Quick newbie question, how can you tell how much ram is allocated/how to allocate more? It automatically allocates/uses more ram with more mods. That doesn't mean you can manually do it. It just does it. Just open task manager and it tells you how much ram it uses under memory. You can tell you are running 64 bit by the bottom left and how it says FNA. So what does it cap at? Your hardware cap? Found I was having some issues with this. For one, I could not delete a world while using this branch, though I was able to do so once I switched back to regular tModLoader. 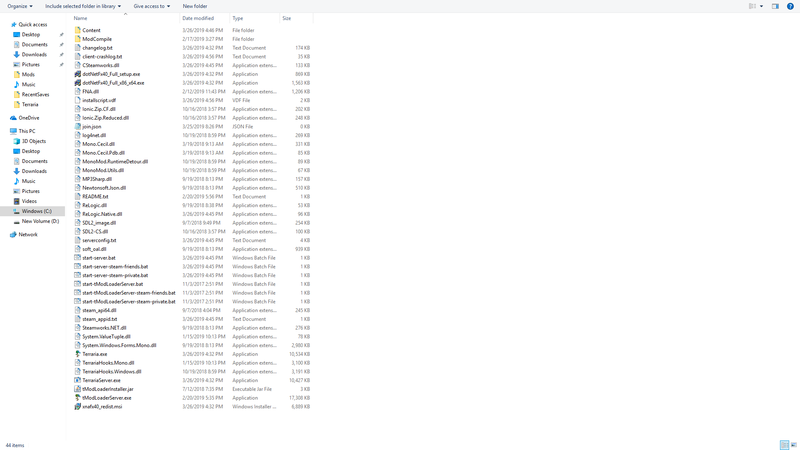 Also, backups were taking a bit too long and being quite frequent/spammy, filling up a lot of space in their folder. This one may have been my fault for not looking hard enough, but I couldn't find an option to have them overwrite previous backups, to make them less frequent, or to disable them. Known issue you manually have to delete worlds/backups. There's two different functions for deleting worlds and characters it will eventually be combined as he Dradon fixed one then broke the other. There isn't an option to disable backing up yet. Just use build three on the docs but it will no longer be FNA. It would be nice to overwrite backups who knows when dradon will do it. It's not an easy to fix tough, as I attempted to fix it like 10 time. Windows kernal API and C# file management system is just being a prick at this point. so this is not compatible with overhaul? Hey, great work in making this 64-bit, going to make it so much easier for people to go crazy modding this already insanely fun game. Just a quick question- is mac support done/being worked on? I understand if its not- great work again! Hello, I've been trying to launch but it just wont launch I've tried reinstalling Terraria but it just gives an error I really want to play but it just wont start any help? I just edited my reply, you can see the error under my explanation. I have both of those things in there but still the same error.